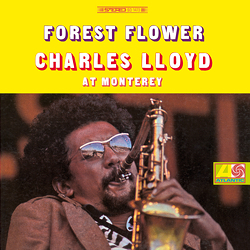 ﻿It was a clever move by George Avakian, producer at Atlantic Records, to record live the Charles Lloyd Quartet during their appearance in Monterey, and to release the LP under the title "Forest Flower". Although the hippy flower-power movement tended towards a rather different musical genre at the end of the Sixties, they were blown away by this music. The four artists attracted masses of people and ensured that every seat was taken and all standing room filled at jazz festivals such as Newport, Molde (Norway), Antibes (France) and the Fillmore East and West. The super group also appeared in Monterey, 120 Km south of San Francisco, the centre of the hippy movement, on 18 September 1966. On the LP we have the almost 18-minute-long title piece and the standard work "East Of The Sun", which were recorded at the festival. The disc is complemented by a Keith Jarrett composition and one by Cecil McBee, both of which were recorded in the studio ten days before the festival. Charles Lloyd is committed to this objective to this very day! All four musicians are still active, although they no longer appear together as a group. Such a special treat for the ears is offered by this newly mastered disc only.